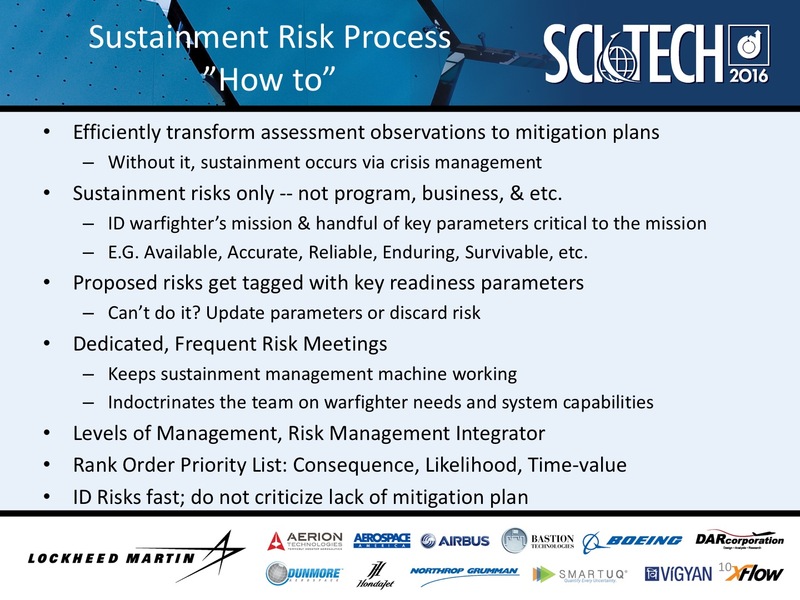 Continuing my blog posts based on my words at my presentation at SciTech 2016, this is chart 10, “The Sustainment Risk Process”. A good risk management process will efficiently transform your assessment observations into short, mid, and long range plans for dealing with expected degradations to the warfighter’s mission. If an effective process is not in place, the sustainment organization simply waits for potential issues to become reality, declare a crisis, and panic. A far better approach is to create and on-going assessment program that feeds your sustainment risk process. A key element of the sustainment risk process is that every risk is associated with actual sustainment. This is not the place to deal with business risks or program risks. There should be forums for those. This is not that forum. If you try, they will dilute the focus on the warfighter’s mission. What if you can’t find a “readiness factor” to tag? This means you either do not have a risk appropriate to a sustainment risk board, or you have not completely understood and defined the warfighter’s mission and weapon system. Either topic is appropriate to the risk meeting and should get discussed. If it can be settled at the meeting, do so. If not, assign an action item or set it as an agenda item for a follow on meeting. It cannot be over-emphasized how important frequent, dedicated meetings are to the risk process. It keeps the entire sustainment management machine working in top order. It indoctrinates the team to continue to be sensitive to the warfighter’s mission — the whole reason the team exists. One final point must be made about the risk process and the risk meeting. It is in management’s best interest to see statements of risk as soon as possible. Any criticism to a presenter or their organization that they have “brought a problem without bringing a solution” is counter to this need. Do not criticize the lack of a risk mitigation plan during a risk management meeting. A valid criticism of an older risk that still has no associated risk mitigation plan is a good topic for a management staff meeting of the top boss and the boss’ “direct reports” or staff.